Let’s Catch up, and Plan Some Meals! First, here’s what happens when you’re not the greatest muti-tasker in the world. I get big ideas, and try to spin as many plates as I can at the same time. So, earlier, while I was preparing and putting our dinner into the crock pot to enjoy later, I had some leftover ground turkey that I didn’t want to freeze. I thought, “Hey, I’ll just patty these suckers up and throw them on the grill to enjoy later on this week”. I like to add them to salads, wraps, etc…so I’m thinking ahead, right? Well, thinking ahead is no good, unless you continue thinking until your project is complete. 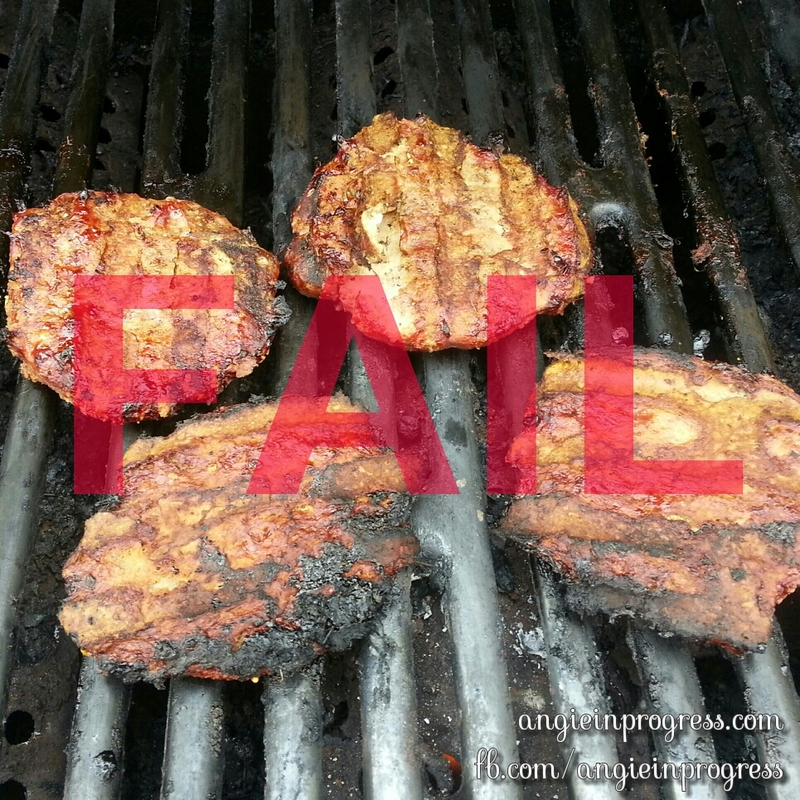 I slapped them on the grill, as planned, and got busy spinning at least four other plates and totally forgot about them until about 45 minutes later. And the only reason I remember them at that point, was because someone randomly used the word “turkey”. TURKEY!!! $#*T! And this was the finished product of that experiment. Luckily dinner was a success! That meatloaf recipe is SO good and SO easy! It turns out GREAT every time! And the only thing that I do differently is to add 1 C. ground oats (the old-fashioned, rolled kind), because I don’t know nothing bout no whole wheat panko – I haven’t located such a thing as of yet! My mom always uses oats in her loaves of meat, so I knew it would work out just fine! I made it through my first week of Insanity…relatively unscathed! It’s become evident that I will be doing extra loads of laundry for the duration! I get sweatier during this workout than any I’ve done thus far. Even sweatier than when I run! I don’t mind it though. It’s a challenge for sure, but I love the feeling of doing something that has been a little out of my comfort zone and finding that I CAN do it! Yes it’s hard, but if it wasn’t, there’d be no point in doing it! I’m flirting with the idea of doing a hybrid with Chalean Extreme and only because I LOVE lifting so much. I really love the results that I get when I do it and I don’t want to lose ground on all of the hard work I’ve put in with Chalean Extreme AND Les Mills Pump. I want the benefits of both cardio AND weights! Also, I’m a little ADD…and it helps to mix it up a little during the week. And now on to the meal plan…I sat outside on this glorious, sunny, summer-like spring day with some of my Beachbody cookbooks. I grabbed the Food Guides from Les Mills Pump and Chalean Extreme; there’s some good eats in there! Just trying a few different recipes this week…mixing it up…keeping it fresh…you know. Also, I had to include a couple of meals that STILL have not been cooked from like 2 weeks ago. This is the time of year when wrenches are thrown left and right! You gotta stay on your toes! I WILL cook those pizzas on the grill if it KILLS me!!! I’m going to be grilling up some flank steak this week, too. I’m a little nervous, because I don’t believe I’ve had beef more than once since about October! I hope it doesn’t wreak havoc on my already ‘iffy’ digestive system! Fingers crossed! Previous PostPrevious Over-Achieving…Just Made My Breakfast!